My hunt for a Commodore 1084S or a similar monitor has been fruitless so far. These screens are certainly hard to come by. I’ve seen one for sale in my country, but it was pick-up only. I got a good tip about e-Bay and the availability of screens from Germany, but the postage is steep and the monitors are not cheap themselves. This led to me to ponder the situation..
What if I got a standard CRT VGA monitor instead? It’s not exactly what I had in my mind, but combined with one of those wonderful Indivision boards from Individual Computers, the graphics will look just like I want them to. 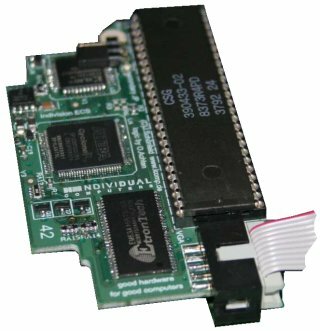 Both Vesalia and AmigaKit has the Indivision ECS for sale. Both companies charge about 99 EUR for one unit. Not a bad price in my opinion. If you’re not familiar with the Indivision ECS, here’s a quick run-down. It’s basically a scandoubler and flicker fixer that can be used in a wide range of Amiga computers. Examples are the Amiga 500, 600 and 1500. With this card, you can hook your machine up to all kinds of VGA monitors. Dual monitor support when two Indivision ECS are connected together in one Amiga! 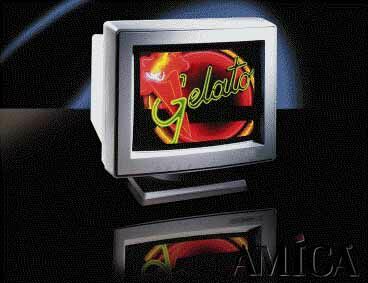 I’ve already got the Indivision AGA installed in my Amiga 1200. This computer is connected to an LCD-screen. I’m satisfied with the quality of the picture, but I want more.. I want it like it was on my old Amiga monitor (except for the eye-hurting flickering in higher resolutions)! 😉 A VGA CRT monitor will go a long way making this dream come true. It is always about luck. Finding someone near you that has a monitor for sale. Holland is not that big of a country so in 3 1/2 hours I can get anywhere so I would not mind driving that long to pick something up.